The JSVG Scale by Jennings offers high-quality precision at a low price, which makes it unique within its market. It is extremely compact (only 4.75 x 3 Inch), so it fits in any drawer or can easily be carried in a purse, briefcase, backpack or in a suitcase for those who travel. It comes with a hinged windscreen to keep the weighing platform and sensors safe when not in use, and protects from drafts. Its quick counting ability makes it easy to know how many pieces you are weighing in no time. 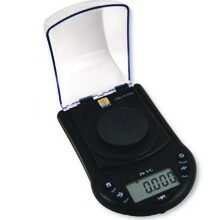 By weighing a sample amount and a simple push of the buttons, you'll get an accurate reading of your parts and pieces. It has a bright, back-lit LCD display that is easy to read, even in dim lighting. It comes with the programmable auto-off option, which allows it to automatically turn off after a few minutes of inactivity. It also comes with a 20 year warranty, so you know your scale will always be working and running at peak performance.